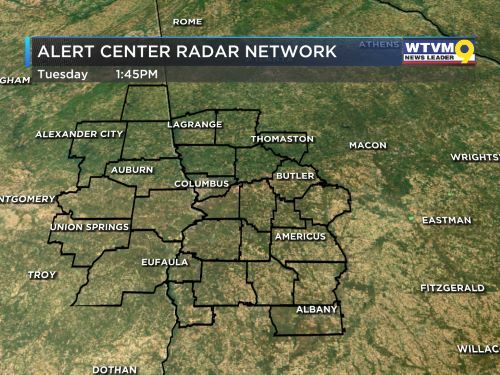 COLUMBUS, GA (WTVM) - After a stormy Sunday, we have a fantastic forecast for the next couple of days with cool mornings (lows in the 40s early Tuesday morning), and pleasant afternoons (70s and 80s on Tuesday, with lower 80s on Wednesday). Thursday will be a day of transition with warm temperatures and increasing clouds. Showers and storms will begin to move in Thursday night, and may stick around through part of the overnight hours and into early Friday morning. We believe that severe weather will be a concern with this system, and we have called for an Alert Center Action Day during this time. Make sure you have a way to get watches and warnings before you go to bed Thursday night! Saturday looks like a cool and breezy day, and those cool temperatures will continue into Easter Sunday morning. Highs will be in the mid to upper 70s during the afternoon and evening. Next week looks warm with rain chances increasing going into Tuesday and Wednesday. WEATHER RADIO WEDNESDAY: Storm Team 9′s next weather radio programming event of the year will be this Wednesday from 10 AM to 2 PM ET at the Kroger in Lanett. You can bring your own weather radio or buy one there, and we can even set you up with our weather app on your smartphone. Let’s get you prepared for spring severe weather season! With severe weather potential in the Chattahoochee Valley tonight, it’s important to know what safety tips to follow. Some myths have floated around regarding what to do before a storm. Tonight we are still expecting a round of severe thunderstorms with embedded areas of wind damage and the potential for tornadoes. The time-frame of greatest concern for the Chattahoochee Valley will be roughly from 1 AM to 9 AM ET. Be sure you are weather alert tonight. FIRST TO ALERT: Severe storms moving in early Friday.